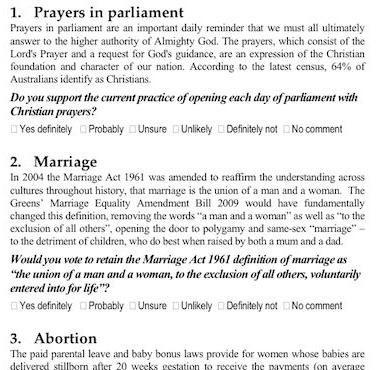 Here’s a brilliantly constructed survey I was sent from FamilyVoice Australia . This was not going to be a highscore entry for me. Here’s a brilliantly constructed survey I was sent from FamilyVoice Australia . Apparently you get 10 points for answering “Yes definitely”, 2 points for answering “definitely not”, 1 point for “no comment” and no points for not answering. From the very first question I could tell that this was not going to be a highscore entry for me. So I’ve been writing a lot of boolean toggling code recently, and it’s been making me sad. Can’t we make it happier? I’ve been writing a lot of UI code lately, and one of the bread-and-butter operations in UI code is toggling boolean state, usually in response to a button press. Now, what does toggling code look like? Thanks Spock. Of course if your language doesn’t have an assigning XOR operator this option is ruled out. If you value clarity of code, or you simply don’t want less brainy maintainers pestering you about what your code is doing, you rule this option out as well. and then tell the object to take on this new state. Bleh! Why the hell should I care what state it currently is in? I just want to toggle it! Shouldn’t I just be able to ask the object to toggle it’s own state; perhaps of even multiple properties in a batch sequence? Naturally, nobody wants to write a toggling method for every writable boolean property of their objects. So either there needs to be automatic support in the platform or some ability to provide a general toggling abstraction. One such example of a crude toggling abstraction would be a Ruby module defined like the following. Such a module could be mixed-in at the appropriate levels of an inheritance hierarchy, or maybe even at the root level if you’re game. Doesn’t a declarative syntax such as this feel much more happy? A youthful and somewhat insensitive re-telling of a classic fairy tale. I present to you a youthful and somewhat insensitive re-telling of a classic fairy tale. given to formulaic naming of their children. Any resemblance to any person, living or dead, is purely (and tragically) coincidental. Once upon a time, there were three little taxpayers and they lived in a Russian town called Chernobyl. Two lived in the outskirts of the town and they had made their homes of poor building material. One whose name was Yuri had made his house of straw. The other, whose name was Yori, had made his house of sticks and branches. Everyone in the town made fun of the them. The other taxpayer lived in the upper-crust of the city and he was very well-off. His name was Yari and he lived in a magnificent sky-scraper and he made fun of Yuri and Yari as well. One day, the big bad tax-collector came along and his name was Yiri. He came to Yuri’s house and knocked on the woven door. So the big bad tax-collector went away and then came back with a bull-dozer. He then knocked over Yuri’s residence. He then went and on and came to Yori’s house of sticks. “Not by the leatherette of my medium filled wallet!” came the reply. And again he went away and this time brought back a demolishing ball. He then knocked down Yori’s house. Then he continued along collecting debts. He then came to the sky-scraper belonging to Yari. And so away went the big, bad tax-collector yet another time. He then came back with a demolishing squad but they couldn’t destroy the sky-scraper because they didn’t have a permit to destroy large buildings. As you have probably known, the big bad tax-collector was very greedy and he just had to have Yari’s wallet. So the big bad tax collector went to the Chernobyl nuclear power plant and he shut off the reactor’s cooling systems and then the power plant blew up causing Yari’s building to glow and melt. The next day the big bad tax-collector came back in his protective clothing and he searched the rubble for Yari’s wallet, which he never found but he was glad he gained his revenge. The moral to this story is: pay your debts or you’ll be sorry! Java developers have many problems but safe resource acquisition and release isn’t one. … but this ain’t one. 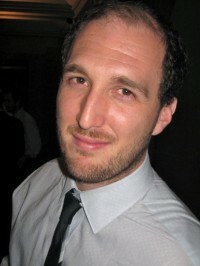 Today Yahuda Katz posted his 10 favourite things about the ruby language. His list certainly reflects most of the things I find very appealing about the language. The sixth item highlights Ruby’s excellent support for blocks and lambdas and an argument is mounted that when performing file operations in languages without them, programmers are forced to use an inline “ensure” block every in the same lexical scope that they originally opened the file in, to ensure that the resource is closed. As is often the case the comparison is made to Java, but as any seasoned Java developer will tell you (and this point has probably be made many, many times) it just isn’t true. Java supports a safer and comparable idiom via the anonymous inner class. No one can argue that this is as pretty or convenient as the Ruby version, but it does ensure that file opening and closing is handled correctly without any effort from the client code. The code in the anonymous inner class can even access variables in the current lexical context, as with the Ruby block, with the caveat that they must be declared final (not quite a lexical closure!). This pattern, in conjunction with the Processor interface may be used any time there is a need for similar resource acquisition and clean–up procedures, as might be the case for locks or database connections. Lambdas and blocks are very useful constructs, and the anonymous inner class can act as an acceptable, if far from ideal, analogue. What an anonymous inner class can’t do is act as a co–routine; this is a truly powerful feature of Ruby’s blocks and associated method invocation features that Java can’t directly compete with. One thing’s for certain: the Ruby community won’t win over Java developers by giving examples of deficiencies where none exist.